Our friends at Hilton St. Anne's Manor (which claims to be in Bracknell, but to my mind is in Wokingham!) have chosen our Konnections ministry to be their charity of the year again, and this Sunday they've got a fundraising event with all the proceeds going to fund the new sensory room the Konnections team are planning. The event is in the beautiful grounds of the hotel, with all the activities listed above to enjoy. Please come and support the event if you're free, and bring family and friends too. In addition the Konnections team need volunteers to cycle the Konnections spinning bike, which we have to keep moving from 10am-4pm. I'm doing a half hour slot on the bike from 2.30-3pm, there are others slots available so if you fancy having a go please contact Anja at anja.davies@kerith.co.uk and join the team! 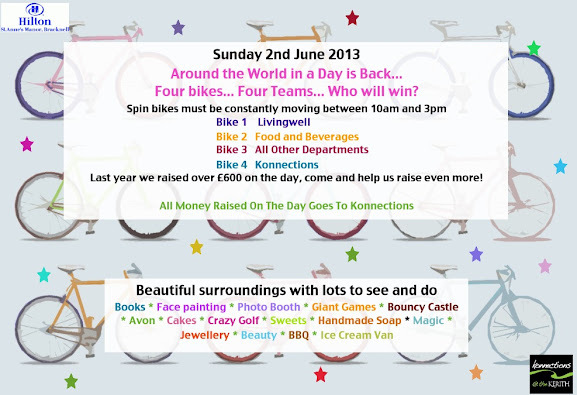 Hopefully some of our fearless Serenje cyclists will join in and help us to win! Everyone cycling will receive a T-shirt to wear, and Anja says she might even have some Swiss Chocolate for all the cyclists as a thank you!! !